Coverage of the BMW Asian Open, a professional golf tournament co-sanctioned by the European Tour and the Asian Tour. A version of this story appeared in the April 30, 2005 edition of the South China Morning Post (subscription only). SHANGHAI — There are, by the most recent count, some 330 million mobile phones in China, so it’s not too surprising that one of them happened to be five feet away from Ernie Els as he lined up a putt Friday during the second round of the BMW Asian Open at Tomson Golf Club in Shanghai. Els was at hole No. 6 and, already at 13-under for the tournament, enjoying a rather commanding lead. He was putting from 10 feet for his third consecutive birdie, his fifth on the first six holes of the back nine. And then that darn phone rang. 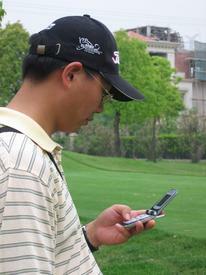 Els stopped his putt in mid-swing, turned around and smiled at the phone’s owner, a middle-aged Asian woman. Others weren’t so kind. Fans yelled at her in English and Mandarin. She managed to stop the ringing — and then the phone rang again. Eventually, the phone stopped ringing and the fans stopped yelling. That’s when Els regrouped and pushed the ball just two inches from the cup, two inches from another birdie. Els’ caddie, Ricci Roberts, was livid. “Thank you, thank you,” he yelled toward the woman with the phone. Then he glared at her. According to tournament rules, photography of any kind is prohibited and mobile phones are to remain switched off during play. But few follow the rules. On Friday, most fans had either one gadget or the other, and they weren’t afraid to use them — some more brazenly than others. David Parkin, tour operations director for the Asian Tour, said it’s a matter of educating local fans who may be new to golf’s various rules of etiquette. Parkin said disruptive fans are sometimes sent back to the clubhouse. But, save for a few comments and a stare or two, nothing happened to the woman who interrupted Els on No. 6. Of course, this is not just a problem in Asia. At least one major tournament — The Masters — has taken drastic measures to keep nuisances off the course. This year, golf fans at Augusta National were asked to walk through metal detectors. Els believes most players would like to see similar steps taken at all tournaments.